Surprise! We’re going on hiatus, but T.L. 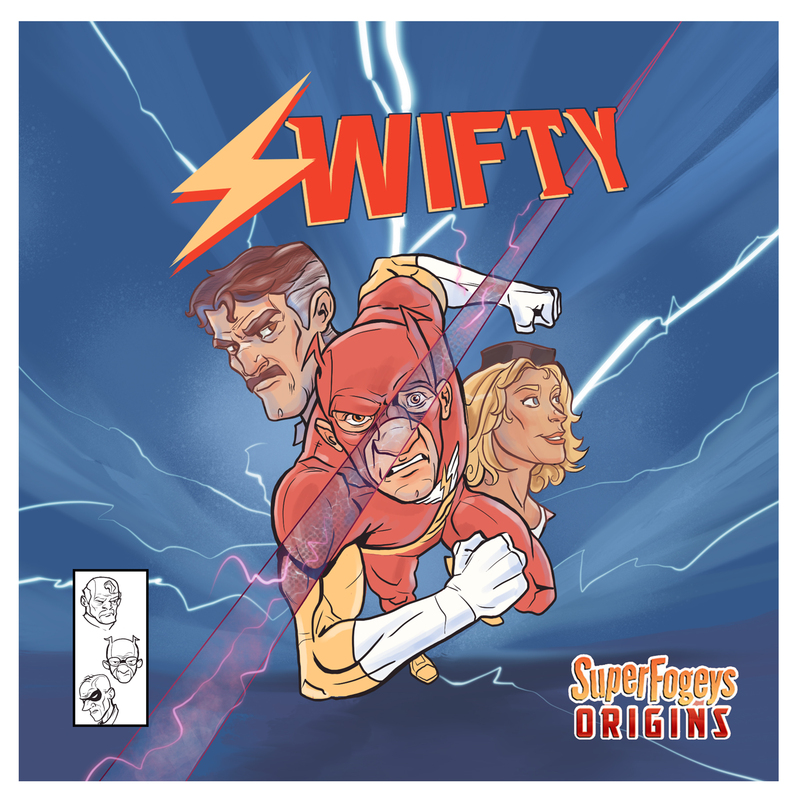 felt bad that a couple of pages were a little late and so he worked up this AWESOME Swifty Origin cover as an apology! How cool is that? The Swifty Origin was in the works for a long, long time before it got to you. Originally, I was trying to bring in an artist who’d never worked on an Origins story before, but after cycling through two possibilities that didn’t work out–and spending hours writing the script and thinking that all that time was wasted–I finally gave up. About a year later it finally occurred to me to reach out to T.L. Collins again. T.L. was the first artist besides myself to ever draw SF, and was the original SuperFogeys Origins artist who illustrated some of the true classics like “The Society of Heroes” and “Soviet Sam.” It had been seven years since we’d had any contact at all, but as soon as we got going it was like no time had passed. To my delight, T.L. had grown quite a bit as an artist in the meantime. The pages he was turning in were stunning, and I was incredibly grateful for that. Part of what held up the completion of this story was my insistence on finding an artist of a certain caliber. I knew given the scope of the thing and the emotion involved that it needed to be somebody with real chops. The artists who were considering it would have done a great job in that regard, but I think T.L. was always the best person for it. This might be my most favorite origin, largely because of his work. The thing I was most worried about with this origin was the narrative trick I was pulling where, halfway through the story, Swifty would turn into an unreliable narrator. I figured you, the reader, would probably not notice it at first, and then, once you did, that you’d chalk it up to Swifty being in denial or not wanting to appear vulnerable to his off-panel audience (who in the last page would be revealed to be Space Pig). It would only be later that it would be revealed that Swifty’s mind was wiped, thus making the “unreliable” part of the narration his actual recollection of the events depicted. He’s an unreliable narrator, but he doesn’t know he is. The other thing I worried about was the revelation that Swifty’s adoration of Star Maiden was, in fact, part of the mind wipe. That last thing I wanted to do was undermine the good feelings readers have towards that relationship in the main story, but I also knew that tying The Pink Shade into Swifty’s tale was the emotional fulcrum of the origin and it was worth going there. The trick was folding in all the little tidbits about the Pink Shade that you’d gotten over the years…founding member of the Lodge of Doom, reformed, joined the Society of Heroes, killed by Tangerine…while still telling the story I wanted to tell. It took some narrative gymnastics, but I do believe it all tracks with pre-established continuity (while at the same time explaining why you’ve never heard before how important the Pink Shade was to Swifty). But still…all the way until as recently as a month and a half ago…I felt like the story was undermining what I had always felt was a genuine connection Old Swifty feels towards Old Star Maiden. Their relationship is one of the sweeter aspects of SF, and I didn’t want to damage it. It finally dawned on me, as the origin was coming to a close, that the last page needed a major rewrite. Originally, the ending was almost an exact copy of the ending to the forgotten origin “The Ballad of Rhonda and Gordon.” That story is so forgotten, that even I had forgotten how it ended: with Space Pig peeing on Swifty to help him sleep off his emotional turmoil. It’s a(n always gross) gag that I had repeated for the Swifty origin to little effect. What finally dawned on me was that Swifty’s origin needed to end with some kind of nod to the Pink Shade. That’s how I got to him pulling out her photograph and staring at it. What does that mean? Does he remember her after all? If he does remember her, is his love of Star Maiden a conscious choice? It means whatever you want it to mean. I know what it means to me, but I’d much rather you decide for yourself. The ending is intentionally ambiguous. Well. That was rather a lot. I don’t usually tell you guys so much about how the sausage is made, but with this one I just felt like spilling. I’m glad you did go into so much depth on the end this time; I actually wanted Swifty to be okay(-ish) by the end I thought Space Pig had handed him the photo- it wasn’t until you pointed out that Swifty already had it that I went back and saw. Either way, it was my kind of open-ended ending. And Swifty’s dad… Hoo boy. It’s small wonder Gordon found something genuine in his connection to Star Maiden..
Glad you enjoyed it! Not everyone likes ambiguous endings, but I tend to favor them over definitive ones. Excites the imagination more.